Ring in 2018 With Family Fun - Happy New Year From NJ Kids! Looking for a family friendly place to celebrate New Year's Eve? It doesn't have to be just a night time event. Think about spending the day at a seaport, an aquarium or on a battleship. Check out some of these destinations in and around New Jersey. Wishing all our readers a Happy New Year 2018! Come see the Fireworks over the Delaware River either at 6PM or Midnight. $10 donation. FREE for members. 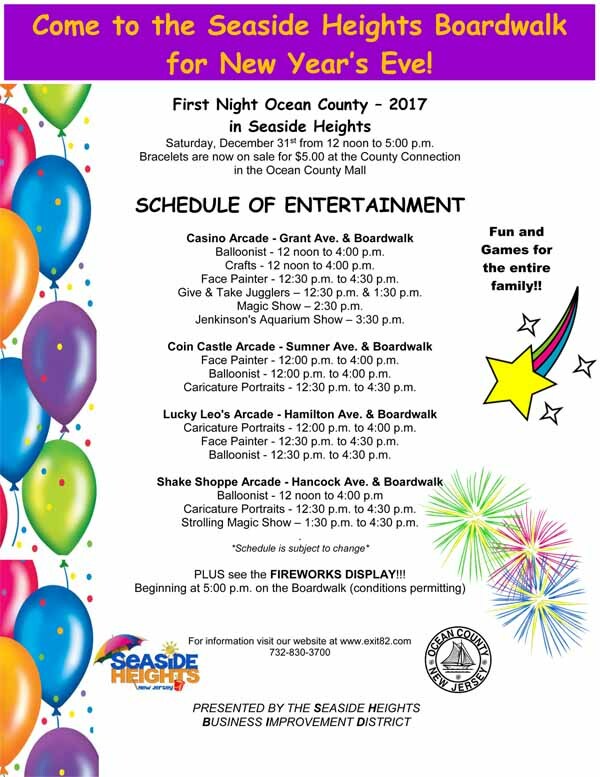 Great New Year’s Eve fun and games for the whole family. Hit the boardwalk arcades for face Painters, Caricature Portraits, Balloonists, Crafts, Magic Show and much more. Fireworks at 5PM. $ Ticket. New Year’s Eve Celebration of the Arts. Family event with over 60 entertainment programs, featuring magicians, jugglers, puppeteers, Broadway Show caliber music, Fabulous Grease Band and more. Fireworks at Midnight. $ Ticket. Get in some Holiday Thrill rides at Six Flags. Bundle up and stroll through Six Flag's winter wonderland on New Year's Eve. Holiday entertainment, festive lights and family rides. $ Admission. Take a winter stroll through the Essex County Turtle Back Zoo this holiday season under the sparkling lights of over 50 winter and animal characters. FREE Admission. Features family activities, dancing, entertainment, food and refreshments. An early countdown to midnight with a falling crystal ball at 7:00 p.m.
Fun for the whole family. Enjoy a day at the museum and then ring in 2018 with the 6PM Fireworks display on the waterfront. Party hats, noisemakers and ginger ale toast. $ Admission. Family Event of the Year. Enjoy a night of unlimited rides, party favors, a live DJ, prizes and giveaways. Watch the ball drop on 5 large screens. $ Admission. FREE under 36 inches. Rock and Splash with the family. New Year’s Eve party with fine food, indoor water attractions, DJ, games and giveaways. $ Admission. Ring in the New Year 2018 with family and fish. DJ dance party and fireworks display over the Delaware River.